Airplane manufacturer, aeronautical engineer. Born: October 26, 1898 Wellsford, Pratt County, Kansas . Died: April 3, 1975 Northridge, California. Lloyd Carlton Stearman was studying engineering and architecture at Kansas State College when World War I began. He enlisted in the U.S. Naval Reserve in 1918. While at the training center in San Diego, California, he learned to fly a Curtiss N-9 seaplane. After the war he was hired as a mechanic by E. M. Laird Airplane Company, later the Swallow Airplane Manufacturing Company, the Wichita company that had manufactured the first commercial airplane in the United States. There he worked hard and was promoted to chief engineer. He worked with Walter Beech. The two men wanted to build metal planes, rather than the cloth covered crafts they built at Swallow. They proposed the use of steel in designing the cabins of airplanes. When no interest was shown in their proposal, they left their jobs and started their own manufacturing company. They turned to Clyde Cessna, who owned a shop building airplanes and training new pilots. Together they formed Travel Air Manufacturing Company in 1925. Stearman left in 1926 and went to Venice, California, where he established the Stearman Aircraft Corporation in hopes of selling airplanes to the growing motion picture industry. That did not work out as he had hoped. He returned to Kansas the following year and set up his factory in Wichita. He began the successful production of the C-3B model which was designed for both mail and passenger service. Charles Lindbergh used this type of plane to survey air routes for Transcontinental and Western Airways. A well known pilot of the day, Ross Hadley of Los Angeles, took a C-3B around the world in 1931. 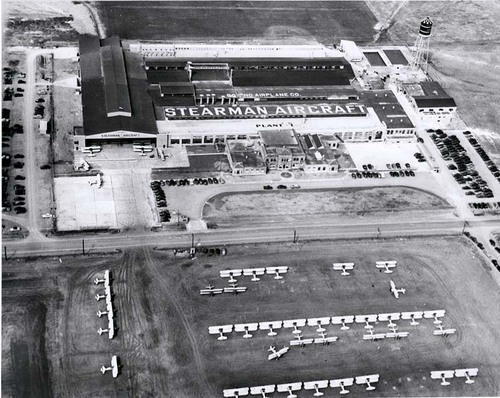 An aircraft holding company that included Boeing acquired Stearman's corporation in 1929, but the company continued to operate under the Stearman name for many years. Eventually it became the Wichita Division of The Boeing Company. Although Stearman left the company in 1931, Boeing engineers continued to use his drawings and they became the basis for both the Model 70 trainer and the World War II Stearman Kaydet trainer. In 1931 Stearman and partners acquired the then bankrupt Lockheed Aircraft Company in Santa Barbara, California, becoming president of the company and designing aircraft. He designed the Electra airplane during this time. He left Lockheed in in 1935 to work for the federal government and other companies, including the Stearman-Hammond Corporation, which he formed in 1936. He returned to Lockheed in 1955 as a senior engineer and retired in 1968. In retirement he formed a new Stearman Aircraft Corporation and worked designing new planes until ill health prevented him from working. He died in Northridge, California, on April 3, 1975. Stearman was inducted posthumously into the National Aviation Hall of Fame in Dayton, Ohio, in 1989.